Several Transition Suffolk initiatives are hosting Apple Days this year in celebration of our great native fruit and all things juicy and sweet - from local community orchards to the best apple recipes. 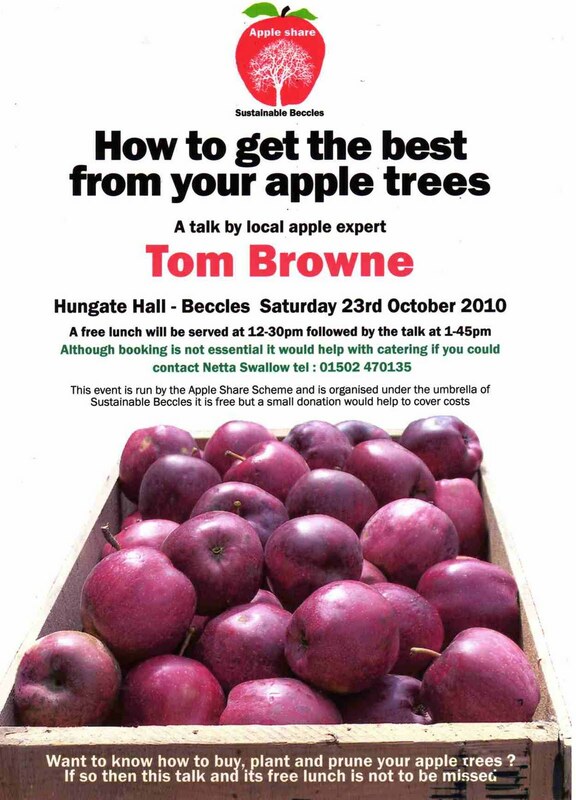 Sustainable Beccles and Halesworth are both holding stalls in their respective town centres on 16 October and Beccles hosting an apple talk and community lunch on 23 October (see poster). Sustainable Bungay meanwhile hosted a stall at this years' Bungay Apple Day on 2 October in collaboration with the Suffolk Wildlife Trust. Our main aim was to promote the Abundance of Fruit project and sign up people with surplus fruit, neglected trees who were keen to help gather, process and redistribute fruit much along the lines of the inspiring Abundance project in Sheffield and similar to the work Transition Beccles and Halesworth are doing. We pressed apples and gave away juice, tried some of the 50 varieties of apples that Jim Cooper of Clarkes Lane Orchard grows and ate Elinor's delicious apple cake (Josiah Meldrum).